Thanksgiving marks the beginning of the holiday eating season, a time when it’s all too easy to make less healthy choices. From creamy side dishes and buttery rolls to cocktails and desserts, there’s a strong temptation to eat more than usual. 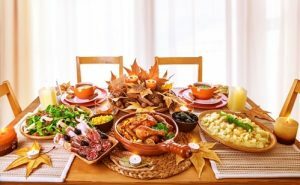 The average Thanksgiving meal comes in at between 2,500 and 5,000 calories, with 250 grams of fat or more, which can put you at risk of gaining weight. In fact, a 160 lb. person would have to run at a moderate pace for four hours, swim for five hours, or walk 30 miles to burn off a 3,000-calorie Thanksgiving dinner. And while researchers at Cornell found that people gain just a little under two pounds between October and December, it took more than five months to lose that weight. Don’t skip breakfast and eat small, healthy snacks throughout the day. When you don’t eat all day to leave room for your Thanksgiving feast, you’ll come to the table very hungry. And when you’re hungry, you usually eat faster, which means you may miss your body’s cues that it’s full. Start the day with a healthy breakfast that includes protein, whole grains, and fresh fruit and eat small low-fat snacks like vegetables, fruits, and low-fat protein throughout the day so you can come to the table hungry, but not ravenous. Limit carbohydrates and high fat dishes. Don’t deny yourself your favorite dishes, but do enjoy them in moderation. Have small portions of side dishes and include vegetables. You can also lighten the fat and calorie content of favorite dishes by reducing oil, butter, and sugar in recipes and making substitutions like low fat plain yogurt for sour cream. Drink water. Make sure you drink enough water throughout the day to stay hydrated. People often confuse being thirsty with being hungry, so drink a glass of water, then wait a bit to see if you still feel hungry. It can also be helpful to substitute water for that second glass of wine, since alcohol adds calories to your meal. Get up and get moving. Take a family walk outside after dinner to digest your meal. Just 15 minutes of walking can burn off 100 calories. You can also increase your active time by taking part in a local Thanksgiving fun run or walk for charity. Make food choices that are good for you and the earth. Choose locally produced foods you find at an area farm or farmers market. Local Harvest has lists of markets all over the country. Try to include organically grown and raised foods on your holiday table. Don’t let the holidays stress you out. It’s easy to get stressed with all that’s going on during the holidays, but set aside some time to de-stress, whether that means listening to music, meditating, going for a walk, or taking a quiet bath. Try to focus on what’s great about the holidays—spending time with people you care about. And remember, Thanksgiving family dinners may provide you with a great opportunity to learn more about your family’s medical history. The more you know, the more we can help you institute great preventive approaches to help safeguard you and your children in the future. Don’t be shy. This is truly important information for you to obtain. Your family will understand.